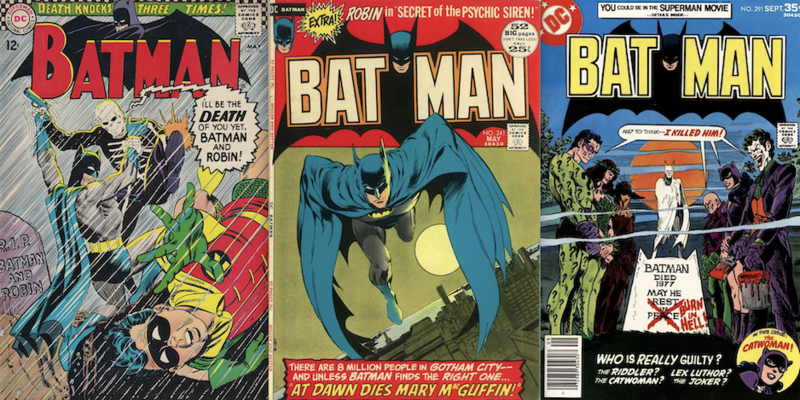 In case you’re just joining us, we asked 13 top artists to name their favorite Detective Comics covers as part of our BATMAN WEEK celebration, since Issue #1000 came out Wednesday. Click here to check that out. You’ll dig it. But we wanted to widen the net and ask them to pick a general Batman cover too, since Saturday is the Dark Knight’s 80th anniversary. (And when we say “general,” we mean any other title featuring Batman.) The selections are below — and they’re just as nifty. Quick note: A couple of the artists only picked Detective covers. That’s cool, though. A number of the rest selected more than one Batman cover. Batman #182. Picking my favorite Batman cover is a tough one. It’s tough because it blurs the line for me about being a fan and a wannabe pro. There were a few that outright blew me away when I saw them on the spinner rack as a kid. Of course, I was always going to buy any issue of Batman that I came upon anyway — as well as just about any comic book I could find. But occasionally a cover promised something beyond what I was used to seeing. Something that transcended — for me — my mantra that even a bad comic book was worth reading. This was one comic I would read everywhere — 80 pages of wild. I would take it with me to visit my grandparents and on sleepovers with pals. We’d all take turns reading it. It finally fell just apart. Batman #244. But THIS — unsurprisingly for many, I’m sure — was the one that still encapsulates everything about what a comics cover should and could do. Neal Adams at his best. This image is burned into my brain. I still remember everything about the day I saw this on the stand: I’d read the issues leading up to it, and had been waiting for it. It was everything I could have hoped for. Batman #241. 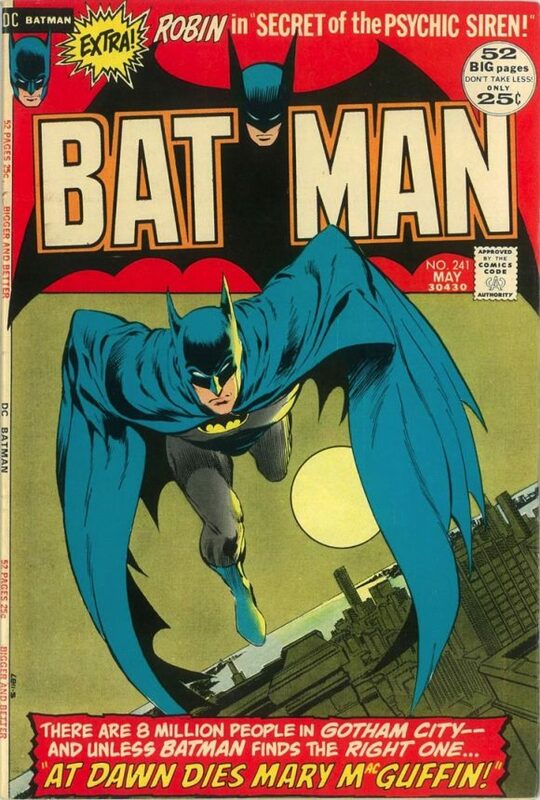 For me, this is one of the most memorable of all of those great Batman covers Neal Adams drew in the early 1970s. 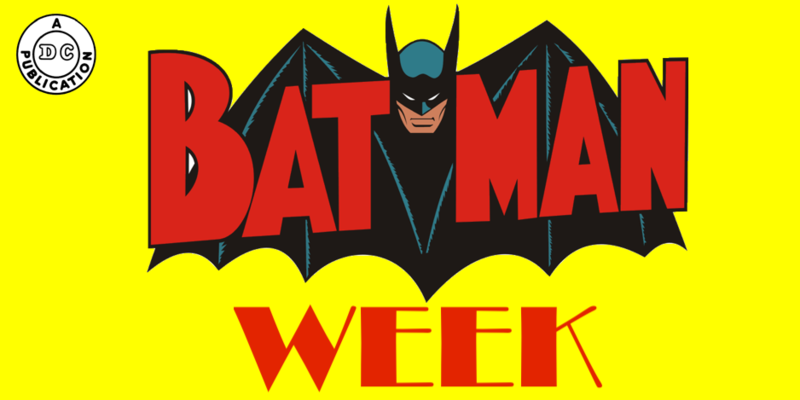 It has a simple, graphic design with a bit of an odd twist: Batman’s arms are drawn back, hidden beneath that big blue cape, suggesting a pair of serrated wings and echoing the bat silhouette we see above, in the first appearance of that new series logo. And is he FLYING? No, look again. He just leapt off the roof ledge of that building behind him. The grim, gothic version of the title character had become a familiar sight by the spring of 1972 but this image still managed to stand out from all the others. Neal Adams can crank up the volume in his drawings when he wants to but this scene is very quiet, from the calm expression on Batman’s face to the lightless Gotham windows below. The original sketch — drawn for a friend of Adams — had speed lines extending from the legs. This final version has none. This isn’t an action cover. It’s a creepy little predawn poem. Bernie Wrightson’s beautiful, sensitive inks are the icing on the proverbial cake. Batman #9. 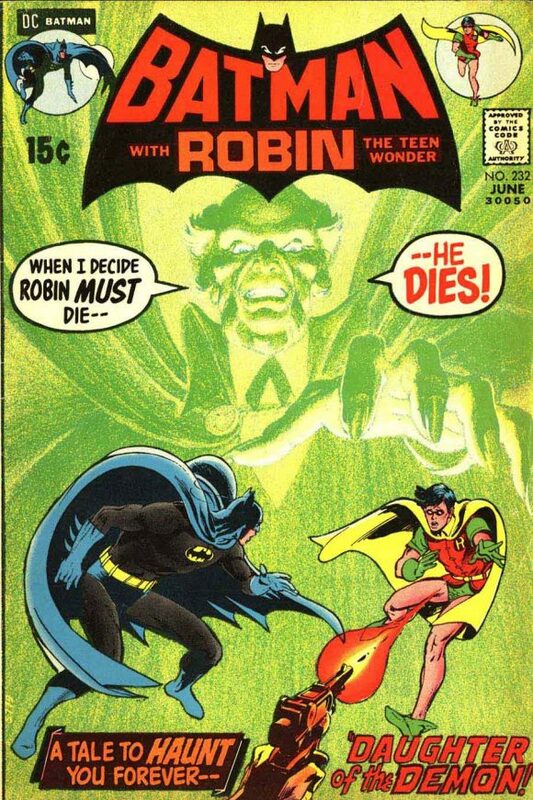 When Robin came on board, the tone of the series changed dramatically. 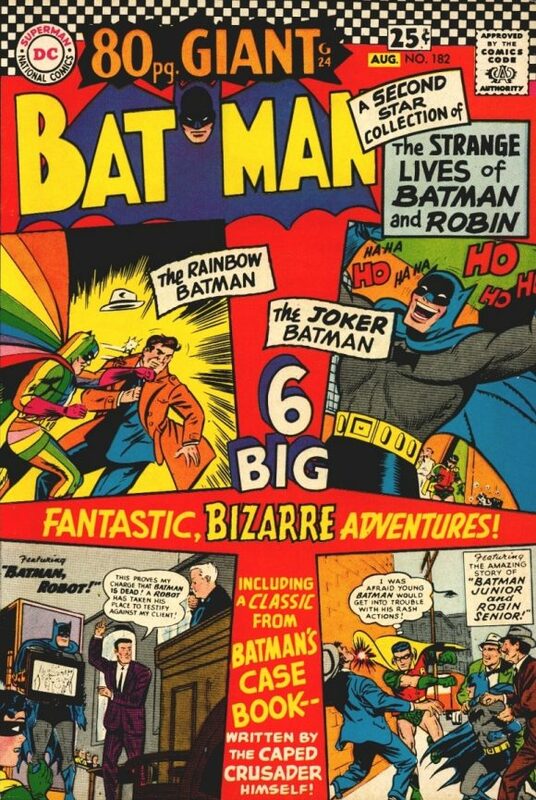 Batman covers in particular, were much more light-hearted. This early entry still manages to capture the noir aspect of the Batman while illuminating the “lightness” of Robin. Fred Ray pencils. Jerry Robinson inks. The Killing Joke came out around the same time as Frank Miller’s Dark Knight Returns, and for me, these were the two books that shaped my understanding of Batman and his world. 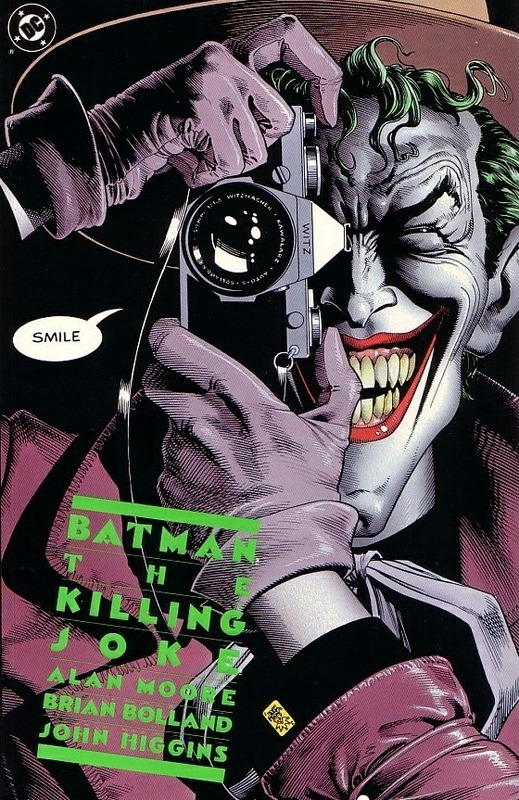 The closeup of the Joker, looking directly at the reader, with this evil grin and the threat of… a camera snap, encapsulated this particular iteration of the character, beautifully drawn by Brian Bolland, whose work I’d been a fan of since reading Judge Dredd in 2000AD. Batman #232. 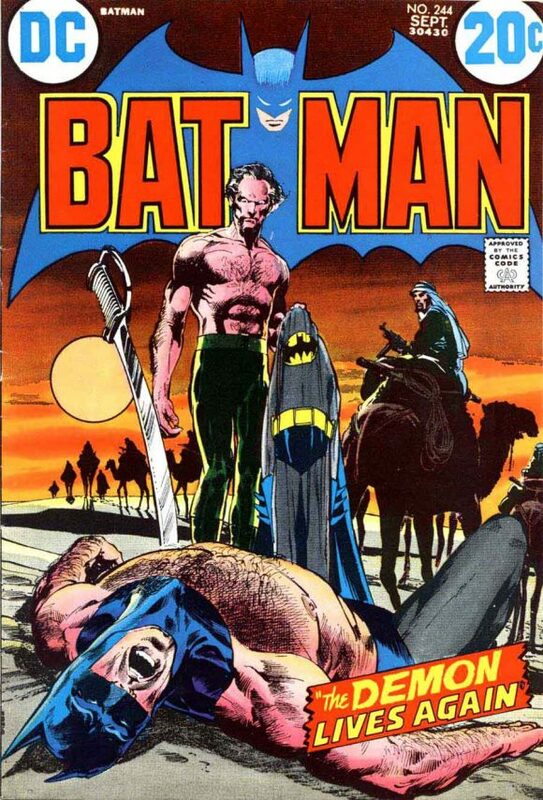 Not only does this cover by Neal Adams feature the first appearance of Ra’s al Ghul, it’s incredibly striking in its own right. Batman reacts to Robin being shot while a ghostly image of this magnificent new villain fills the background. It appears that al Ghul was rendered in crayon (he wasn’t), which helped capture the ethereal effect that was then driven home with the perfect coloring job. Batman #20. 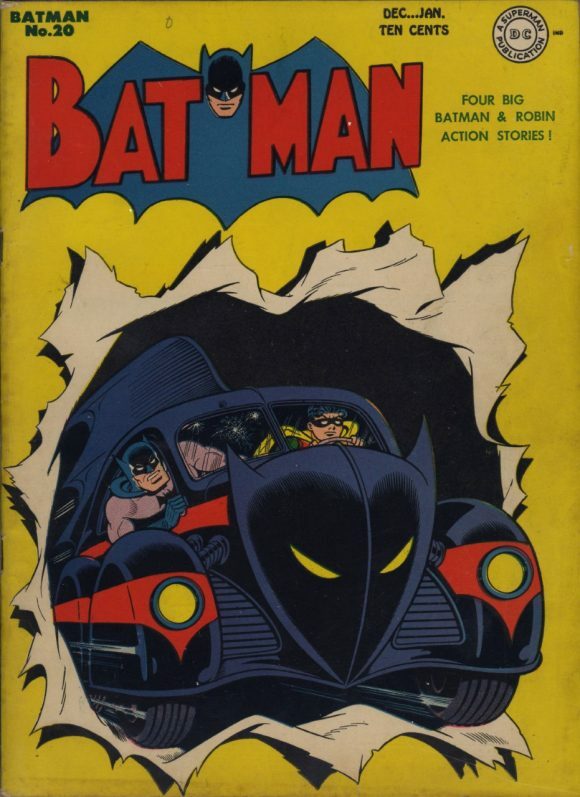 I’m a sucker for Robin driving the bullet-riddled Sprang-mobile! Batman: Black and White #4. 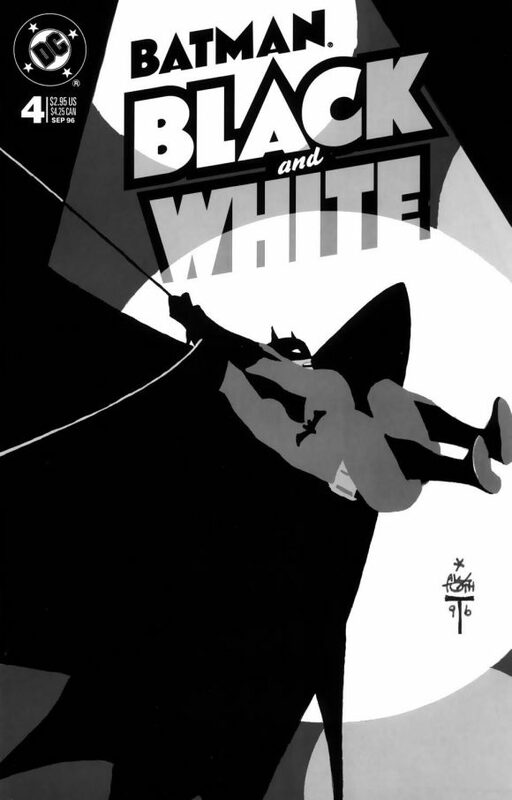 Why isn’t every Batman book in black and white? They should be, but I’d probably be happy if every comic published was monochromatic. If I’m in an art museum I always gravitate toward the black-and-white pieces and the same thing goes for comic-book covers. And look, this one is by ALEX TOTH! He was a master craftsman with limited comics output and this is a late work for him, but isn’t it amazing? So bold, even to the point of cropping the figure’s feet, something any portfolio reviewer would tell you is verboten. But you know why it works? Because Toth was a master! You weren’t listening. Instead of reading more of what I have to say, take a few extra minutes and study this cover. Then go out and buy all of Alex Toth’s other work. Batman #111. The very first original American comic I ever saw. I’d seen reprints before, but they lacked the full-color glamor of the real thing. My cousin owned it and no matter what I offered, would not swap it with me! Batman #279. What, TWO Riddlers? I always thought this cover was cool! 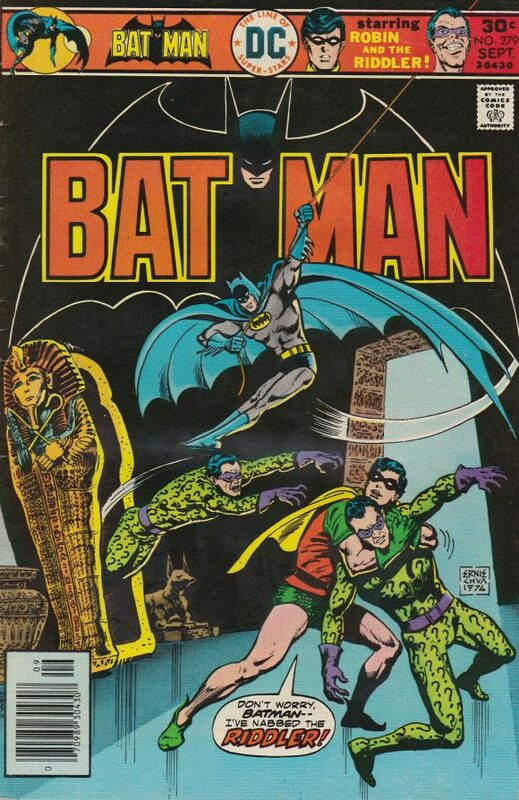 Surprise sneak attack on Robin, Batman swooping in, and mummies! 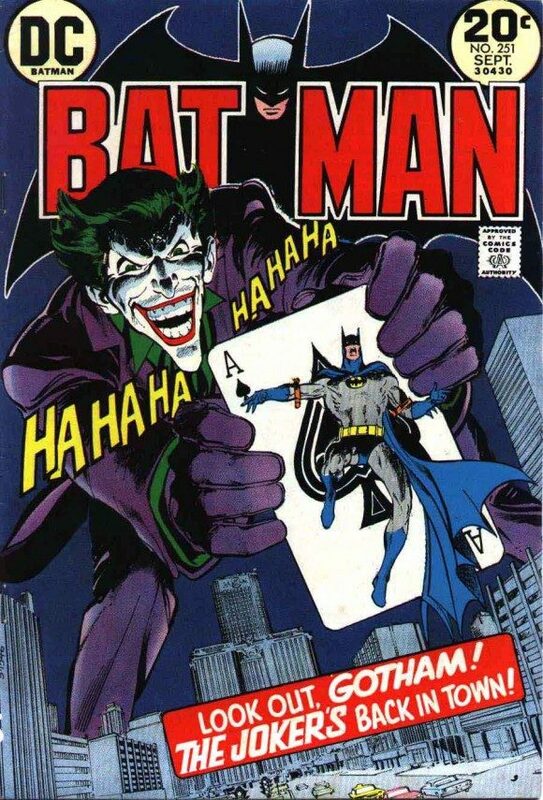 This was one of the first Batman comics I had with the cover intact. Ha! Plus, the Riddler was my very first Mego bad guy. But now I can have two Mego Riddlers to recreate this cover. 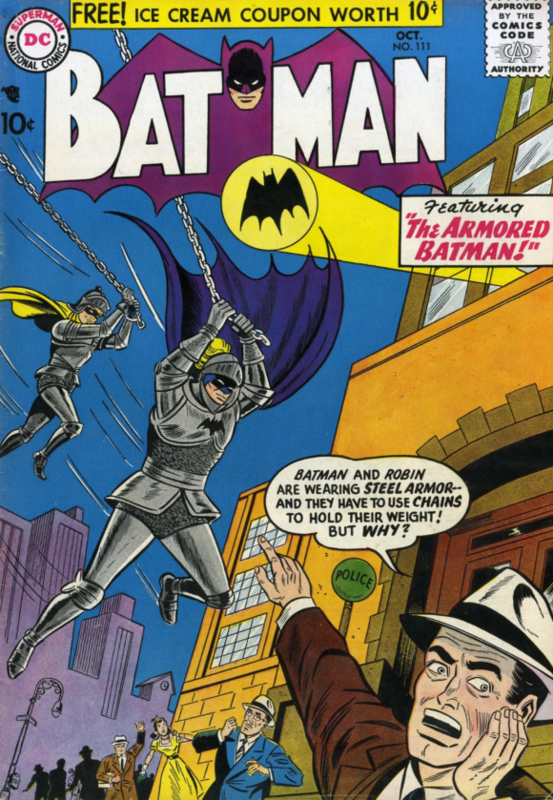 Batman #171. AW YEAH! Another Riddler cover. I love this because no matter how many times the Dynamic Duo punch the Riddler, he likes it. In fact, he is laughing hysterically. And, I had a Riddler Mego as a kid. Still have him too. But if you know me, you already knew that. HA HA HEE HOH! Batman #291. What? Batman defeated? Batman dead? Holy gosh! All the bad guys on the cover together! All at once! Always loved this cover. But, I always thought it was weird, yet cool at the same time, that Lex Luthor was there to celebrate with Batman’s villains. Even Lex hated the Dark Knight. CLASSIC! Batman #180 is the one that probably made the biggest impression on me. My older brother Lee (my comic-book guru) and I could walk just off the hill to Roseburg, Oregon’s main drag (Jackson Street) to buy our new comics at a couple drug stores. (Now, one of the best comics shops I’ve ever seen is there, Heroes Haven. Worth the trip!) Eventually, Lee ventured a little farther down, next to the river, to find a second-hand store that had stacks and stacks of used comics for a nickel each (if I ever make my time machine work…) and this cover leapt out of the stack begging to be mine like no other. 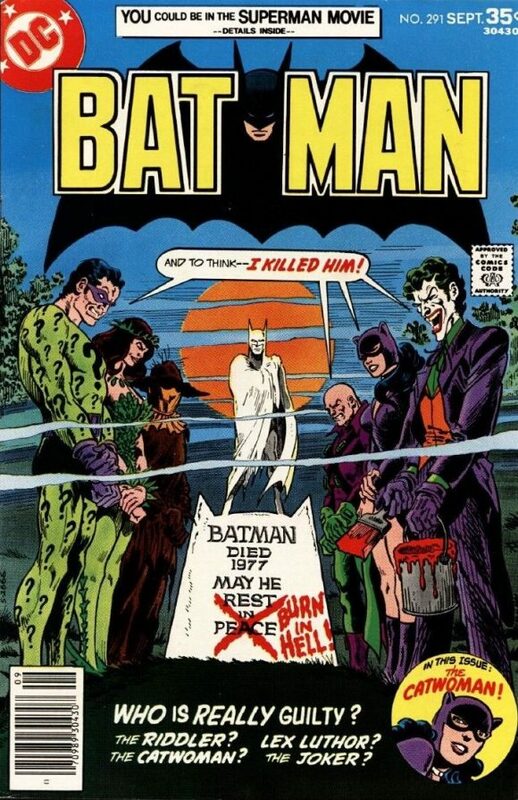 Batman #251. We were reintroducing the Joker after an absence of four or five years. It presented a problem for the cover. The two characters were opposed to each other, hero and villain, so logically they would face each other. In that case, you would get a profile of each. Or, if you favored one, you would see the back of the other’s head. If you favored the other, the same problem would arise. How do you have both characters face the camera? Why, you simply tie one to a playing card and have it thrust forward by a giant version of the other above Park Avenue and never, ever tell people why you did it that way. 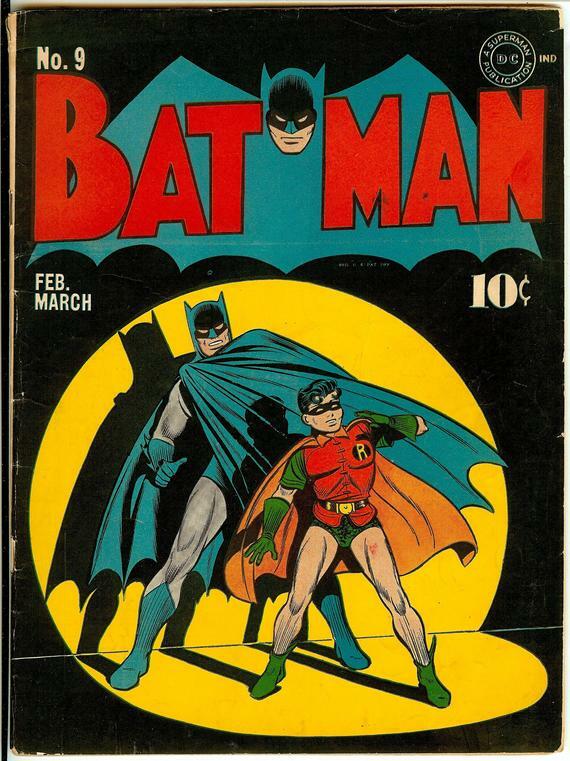 — 13 Top Artists Pick Their Favorite DETECTIVE COMICS Covers. Click here. Great selections; anything by Neal Adams gets me going. But my very first issue of Batman when I was 7 was indeed #180. 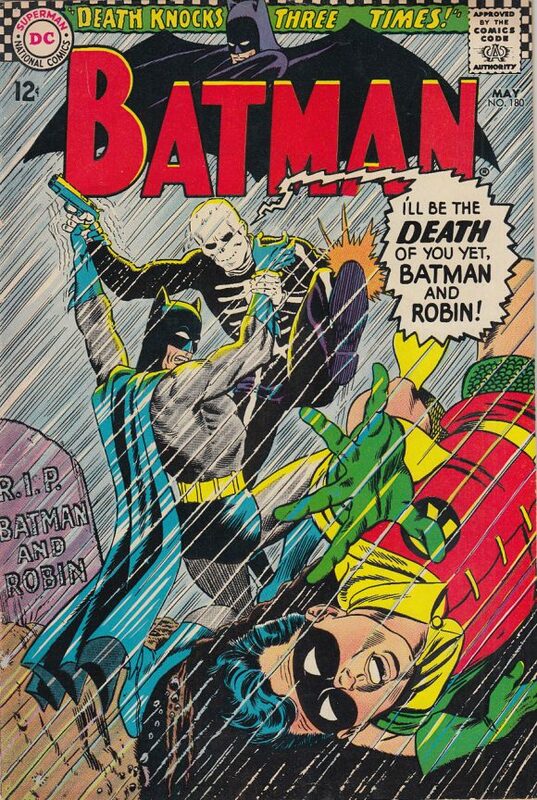 Blown away by Death Man and Batman struggling with Robin kicked into the grave. My dad bought that for me when I was sick and home from school. I re-read that over and over in bed! BATMAN 244 – I love Neal’s work. Always have. But, that cover always struck me as being a bit odd. Ras is holding a full costume. Shouldn’t it only be the top half? Maybe I’m forgetting part of the story.